1) Identify appropriate juvenile tarpon habitats for protection and restoration. 2) Work with NGOs, government agencies, and anglers to protect and restore juvenile tarpon habitats. 3) Conduct an education campaign to promote the value of juvenile tarpon habitat restoration. BTT conducted habitat assessments in two locations on the west coast of Florida to establish a baseline for the upcoming restoration of those sites. The resulting information will guide future restoration efforts. BTT launched a juvenile tarpon habitat project near Charleston, SC in Spring 2015. 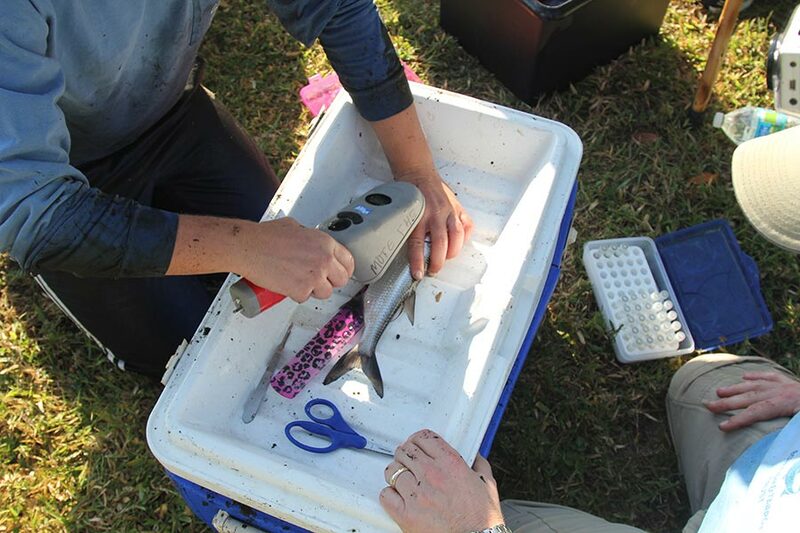 The goal of the project is to gain a better understanding of juvenile tarpon habitat use and what that means for the adult fishery in South Carolina and nearby coastal waters. At the end of this project, we will be able to determine the survivability of juveniles in South Carolina and determine what that entails for future projects and management efforts in that region. BTT started a juvenile tarpon habitat mapping project in 2016 in Florida to map juvenile habitats to prioritize for protection and restoration. Click here for info and to participate. Here’s something that many don’t know, or just don’t think about when they are out chasing big tarpon: As juveniles, they depend upon backwater wetlands and swamps. Without these backwater habitats, we would have few juveniles surviving and becoming the big fish that make anglers weak in the knees. In other words, places where most anglers don’t fish are essential to the fishery. Unfortunately, in many areas these backwater habitats have been lost or have become degraded. In fact, the loss and degradation of juvenile habitats is a major reason that a recent International Union for the Conservation of Nature scientific assessment classified the tarpon population as “vulnerable.” This is why Bonefish & Tarpon Trust launched the Juvenile Tarpon Habitat Initiative a few years ago. We’re pleased to report that the program is gaining steam. Mangroves are essential habitats for coastal ecosystems. They provide critical habitat for many species of gamefish and their prey. This is especially true for tarpon, whose juvenile life stage depends upon healthy, shallow mangrove and marsh habitats. Since healthy fisheries depend upon healthy habitats, especially juvenile habitats, there is an urgent need to protect and restore juvenile tarpon mangrove nursery habitats. Unfortunately, mangroves are under threat worldwide: globally, approximately 35% of mangroves have been lost, and continue to be lost at a rate of 2% per year; in Florida, approximately 50% of mangroves have already been lost, and degradation of these habitats continues. Since the amount of available habitat is one of the most important factors in determining population size, the loss of these critical habitats has direct and immediate effects on tarpon, snook, and the fisheries they support. These juvenile tarpon nursery habitats are likely to be in close proximity to urbanized areas, have already declined in coverage and quality, and are under continuing threat. In the United States, coastal areas comprise approximately 17% of the total land area, and 25% of coastal areas are expected to be developed by 2025 – with more than 50% of the nation’s population living in coastal areas. As coastal human populations continue to increase, coastal ecosystems and the fisheries they support are becoming increasingly stressed due to factors such as habitat loss and degradation. Therefore, there is an urgent need to protect and restore these critically important habitats. Even when coastal mangroves and salt marshes are protected, which limits direct impacts from development, much of the uplands have been developed or their freshwater flow patterns altered, thus degrading habitat quality of the adjacent mangrove and marsh habitats. Thus, although many mangrove habitats don’t appear to have suffered direct damage (i.e., from clearing or dredging), the effects of upland habitat degradation on mangroves are just as damaging.